With Collinsville trailing by two touchdowns and only 4 minutes left in the game Levi Draper (#10) gave the Cardinals a chance when he took the ball away from the Bulldog ball carrier near midfield. Collinsville took advantage of the late opportunity and pulled within one touchdown on this 4th down 13 yard TD pass from Shawn Koscheski that Sam West (#13) stretched just over the goal line with 1:54 left in the game. Cole Hadley's PAT kick made the score 14-21. Skiatook's kickoff to start the game went out of bounds. After Skiatook scored on a 58 yard run at 8:16 in the first quarter, their next kickoff (series) was almost comical (2 out of bounds and one procedure penalty) before they finally rekicked from their own 25 above. Collinsville took advantage of the short field as they fielded the kick at their own 45 and scored 7 plays later. Sam West (#13) nearly scored on this first quarter Shawn Koscheski pass from near the 30 yard line. He slipped these two would-be Skiatook tacklers at the 15 yard line above and got within the two yard line. Shawn Koscheski (#1) handed off to Ryan Haymaker (#25) for the final yard of the Cardinals's first touchdown drive. Dakota Tredway (#52) and Jake Douglass (#56) are two of the blockers clearing the way on this play at 4:51 in the first quarter. Hadley's kick (below) tied the score at 7-7. Roc Robbins (#44) provides the long snap for extra points with Brandon Lowe (#2) placing the ball for Cole Hadley's kick. Jackson Wilson (#61) is of of many providing the blocks. A long run followed by a 10 yard TD pass gave Skiatook back the lead early in the 2nd quarter at 7-14 with neither team scoring again until the 4th quarter. Chandler Cole (#6) brought the Skiatook QB down for a loss on this 3rd quarter play. Tyler Forrest (#81) was trailing the play and intercepted as Chase Wilkins (#7) knocked the ball free from a Skiatook receiver with Skiatook in Collinsville territory and just over a minute left in the 3rd quarter. Skiatook did score on their next series after a long pass to the 10 and a 10 yard TD run at 8:39 in the 4th quarter for a 7-21 score. Ryan Haymaker (#25) was up-ended on this carry near the Skiatook 38 yard line. 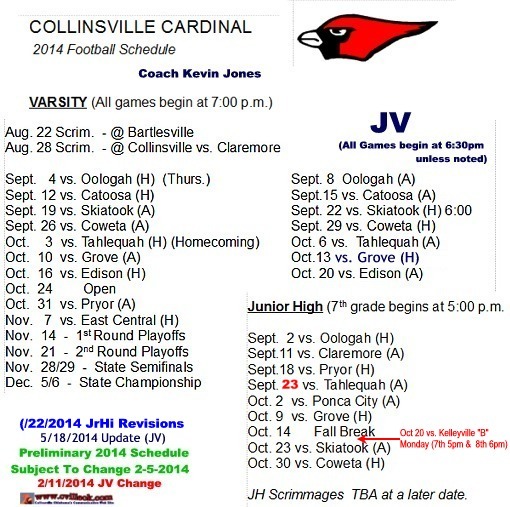 Collinsville turned the ball over on downs a few plays later with 4:09 left in the game and trailing 7-21. Levi Draper got the ball back a few plays later for a Cardinal rally that fell short. QB Shawn Koscheski (#1) was scrambling all over the place as the Cardinals needed two 4th quarter scored to tie. Skiatook kept him out of the endzone. The final Cardinal drive consisted mainly of Koscheski runs and passes to Erickson and West. After Collinsville pulled within a touchdown with 1:54 left in the game, the onside kick was recovered by Skiatook and the Cardinal defense forced Skiatook to punt back with 1:24 remaining but 74 yards to cover. The "Highway 20 Bowl" trophy ended up in the hand of Skiatook for the first time in it's 4 year history.